Digging deeply into the treasure trove of knowledge he has acquired throughout his years a climber in the North Cascades, Blake has just finished a new guidebook. 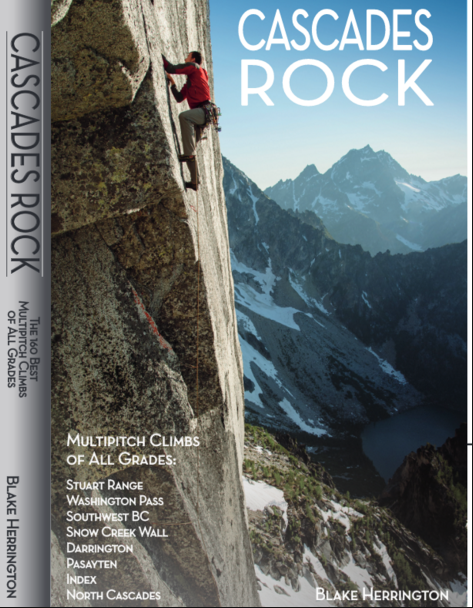 Cascades Rock details 160 routes in the region and includes dozens of topos, interviews and photos. And, it's in full color! Blake took a chance with this book. Many of the mountains and features covered here are covered in other texts. There is a lot of competition. But he needn't worry too much. His book is absolutely beautiful and stands out dramatically against the competitors. The book covers peaks, like Dragontail and Prussik. And it also covers walls, like Snow Creek and Green Giant. But what makes this book stand out is the attention to detail. I've climbed Green Giant Buttress three or four times, and every time I've found myself floundering, trying to understand where routes are. But Blake's book is so detailed the I don't think that will happen again. In addition to some of the well-known walls, Blake's book also includes several lesser known areas. 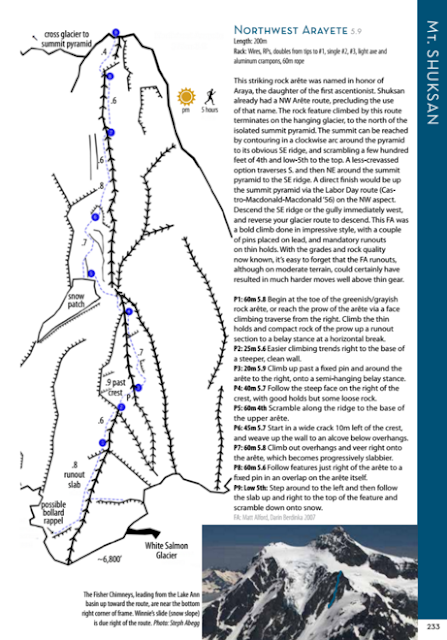 He covers places like the Twin Sisters, Mamie Peak and the Supercave Wall. Each chapter starts with a map of the area, a breakdown of camping issues and red tape and then launches into the meat. Many of the routes have photos and topos, and every route has a description. Each page is filled with multi-color information which is incredibly pleasing to the eye. Some of the routes are a bit remote. It can be somewhat daunting to burn a day trying to get to a route, only to get stymied by bad approach or climbing beta. This is unlikely with Cascades Rock. The book doesn't get bogged down in any one thing. Instead it provides all the beta you need to climb a route. The only criticism that I have of this book, is that it is heavy on harder climbs. There's no doubt that the climbs in the book are awesome, but he probably could have added a couple dozen more routes in the 5.5-5.7 range for those who want to get after it with a little bit less commitment. The most important thing that any guidebook can give you is a bit of psyche. There are a lot of routes in Blake's book that I was aware of, but didn't have that tight a grasp on. The situation is different now. I can't wait to get out there and try some of the lines that he's detailed in this book! Check out Blake's book, here. 10 Essential Backcountry Ski and Snowboard Tips!